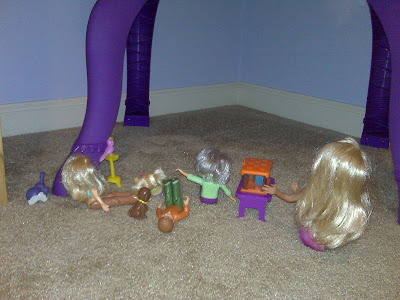 After dinner last night Addison and I went upstairs to play with her dollhouse. I haven’t had the chance to play dollhouse with her (usually Jay gets dragged in) so I was excited to see what she would do. After taking all the furniture out and putting it all back in (at my insistence… there’s something about a bathtub, kitchen table, and piano in one room that really bugs me!) we got down to the business of playing. I put one girl at the piano and Addi tucked several “babies” into bed. A few minutes later Addi made the “mommy” get out of bed and climb the stairs. Then she yelled, “You go to time out. Quit playing your piano and waking up the rest of us.” So my girl went to time out. Next to succumb was a bunny in a dress. Standing on the kitchen table. Never a good thing. I'm not sure what the hamster did but it must have been bad.